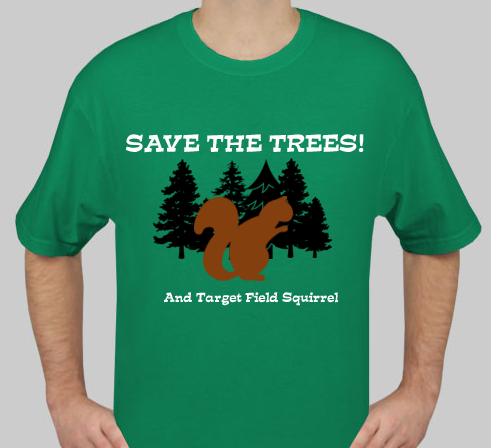 Save the Target Field Squirrel and Pine Trees! | That's Twins Baseball. A Minnesota Twins Blog. Save the Target Field Squirrel and Pine Trees! The Twins have recently announced they will be removing the trees in center field because they’re distracting to hitters (other than Jim Thome). Not only will there be more CO2 present at games now, there will also be no home for the Target Field Squirrel and Denny Hocking. The People For The Ethical Treatment of Trees and Squirrels (PETTS) is protesting this by producing a t-shirt that lets you show your pride for boxelder bugs, pine needles, bad depth perception, and of course, the Target Field Squirrel! Show the Twins how much you hate this idea by buying one of these shirts. All proceeds will go to PETTS members…. I'm just kidding you know...right? BTW, the tree removal part is real, the shirt part or PETTS isn’t. One Response to Save the Target Field Squirrel and Pine Trees!